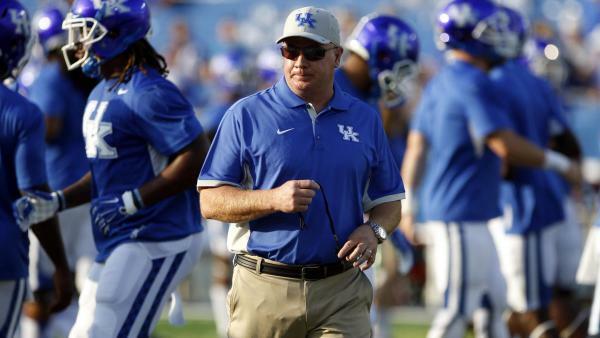 While the Florida letdown lingers, Kentucky's big picture goals are still intact. Kentucky heads west to Mississippi State this weekend with a lot on the line. A victory would clinch bowl eligibility for the Wildcats, with potentially much more at play. Most notably, winning Saturday would move Kentucky to 6-1 for the first time since 2007. The upcoming clash between the 'Cats and 'Dogs is one for the record books; entering meeting 45 between the two, Kentucky and Mississippi State are tied at 22 wins a piece. Though the Wildcats have won three games by one score, Kentucky is also one play away from a perfect first-half of the regular season. The Wildcats forced two fourth downs on Florida's late go-ahead scoring drive and, after the Gators took the lead on a second blown coverage, had a holding penalty cost the offense 20 yards of critical field position in the loss. When an Austin MacGinnis 57-yard field goal fell short, Florida extended its winning streak over Kentucky to 31 games. Against the Gators, the Wildcats had multiple chances to change history; at 5-1, they can still make some of their own. Upcoming outings with Mississippi State, Tennessee, Ole Miss and Vanderbilt await with opportunities to add to Kentucky's win total, but also maintain the status quo ahead of a potentially-huge game at Georgia on November 18th. It may not necessarily feel like it, but the Wildcats are the lone SEC East team with one conference loss, with a head-to-head contest with the in-division Bulldogs still remaining. While the Florida letdown lingers, Kentucky's big picture goals are still intact. Most immediately, success in Starkville would likely move Kentucky into the national polls. The task is a tall one for the Wildcats, who have won just once in the Mississippi State series since 2008. Last year's 40-38 victory was a dramatic one, with MacGinnis kicking a game-winning 51-yard field goal as time expired. This time, more than memories could be at stake. Kentucky, with more of the same, has a chance to continue to move past the Florida defeat and settle into a newfound prominent position.